Which Infrared Thermal Camera Should I Buy? Besides being fun and cool, can the Flir ONE infrared camera be helpful in assessing wall cavity insulation, attic insulation consistency or detect air leakage in a home, with or without the aid of a blower door? I'm a general contractor and I'd like to get an inexpensive IR camera- what are your thoughts on this matter? Thanks for writing! The short answer is a big fat NO- any pocket infrared camera has very low resolution, and while they're great at demonstrating the simple fact of heat fluctuations, I wouldn’t trust it for QC and inspection of homes. The resolution on a Flir ONE is 80 x 60- that means, incredibly, there are 5,400 infrared thermometers embedded in it, but that's not enough to give you a clear, colorful picture most of the time. 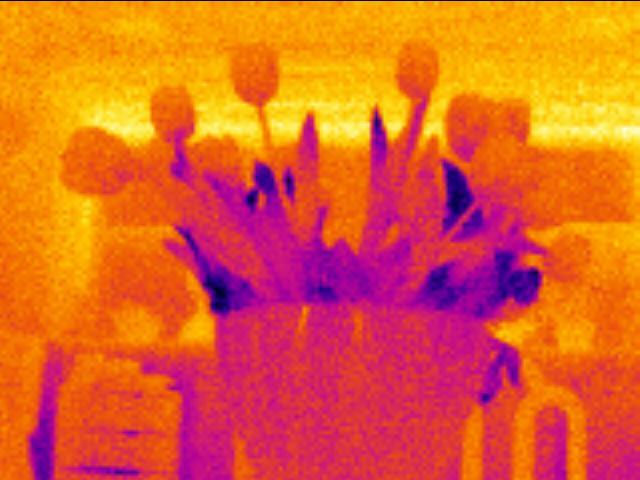 See here, in these three images taken of a big bunch of flowers, using the Flir ONE, a Fluke TiR110, and a Testo 885. While the Flir ONE's 5,400 sensors (80 x 60) are assisted for clarity by combining with the visual camera's outlines, you can see that the Fluke TiR110's 19,200 sensors (160 x 120) mean four times as much resolution! And the winner here is the Testo 885's 76,800 sensors (320 x 240), which give your eyes the clearest picture yet- that means this >$10,000 camcorder-style infrared camera has almost 15 times as many sensors as the Flir ONE. That being said, bang-for-the-buck-wise, I got my ONE for $250, 1/40th the price of the big mother. That's a good deal. I carry the Flir ONE in my pocket, where it stays connected to my iPhone 24/7 so I can shoot infrared photos of whatever is cool on a daily basis. The Fluke TiR110 I take on all my building forensics jobs. And the Testo 885 I'm using to shoot a high-def video in infrared. Each has its own special uses. The wire supports are almost completely invisible in the Flir ONE's 80 x 60 resolution, even WITH the added outlines from the visual camera. You get more resolution and snap in the other two cameras, again with an obvious winner in the 320 x 240 resolution. And by the way, anytime you use the infrared camera for home performance testing, you should DEFINITELY always use a blower door to reveal the air leakage- otherwise, you're at the whim of stack effect, wind, and HVAC pressurizations. I hope this helps with your decision- being a building performance analysis ninja means having the right equipment, and there's probably a reason why the nice tools don't get carried around with you everywhere (hint: $10,000)- that's why it's nice to have a range, if you can swing it!